Villa Spice is a holiday abode where you’re surrounded by all the right kinds of blue. 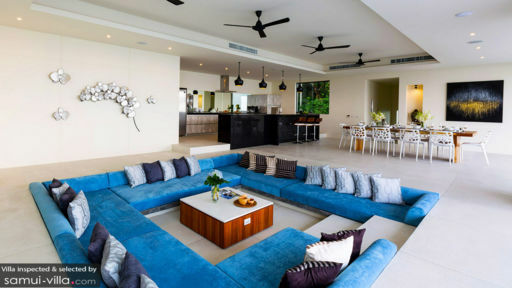 Set along the coastlines of Hua Thanon, this oceanfront villa overlooks the turquoise ocean and clear blue skies. Each and every day you’ll wake up to a visual feast and the cooling ocean breezes. Containing a total of five bedrooms, the villa is ideal for accommodating friends and families embarking on a group getaway to the tropics. Five bedrooms sleep ten adults and two kids at Villa Spice. The vibe is elegant in the well-appointed bedrooms; each features cream-hued walls and glass sliding doors that draw the gaze out towards the ocean. Amenities like pillowy beds, private balconies and en suite bathrooms are common to all bedrooms. It’s not hard to see why the spacious outdoor deck is a favourite hangout among guests. Pillowy recliners lining the deck offer a cosy seat for taking an afternoon snooze, basking under the sun or indulging in poolside libations. When you need to cool down from the heat simply take a dip in the sparkling infinity pool. Expansive windows, loft ceilings and an open plan layout creates a sense of spaciousness within. The interiors are comfy and contemporary, and are adorned with modern fixtures and pleasant cream hues. The dining area comfortably accommodates ten guests for communal meals, and offers views out to the pool and garden. Next to the dining table lies the indoor lounge, a bright and inviting space furnished with cushy sofas and a wooden coffee table. 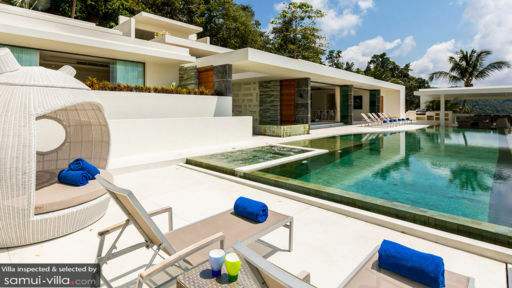 Villa Spice is a full-service property with on-site staff. Housekeeping services, security services, a daily breakfast service, and one round-trip airport transfer are included with your stay. Amenities available at additional cost include personal driver services, boat rental, car rental, laundry service and in-villa massages. The villa offers family-friendly amenities. A baby cot and high chair are available for use free of charge, while professional child minders may be engaged at additional cost. 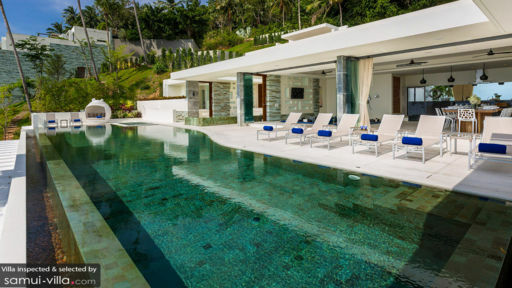 Villa Spice is located in Nathon, North-West Samui. As the capital town of Samui, Nathon is serves as the island’s main business and administrative centre. The main highlights for holidaymakers include the town’s beautifully preserved wooden Chinese shophouses, waterfront dining venues, lively shopping scene and spectacular sunsets. With myriad stalls and lower prices, Nathon offers one of the best souvenir shopping experiences on the island. Check out venues like Little Buddha Aromatherapy Products for its extensive range of essential oils, bath products and cosmetics, as well as Khunchan Furniture and Home Décor for its Buddha statues, spirit houses and home accessories. The Nathon Walking Street is a must-visit on Saturday evenings; there’s plenty of street food and souvenir stalls set up across a sprawling seafront plaza. Hippocampe French Bakery, The Siam Residence Boutique Resort and Lai Thai Restaurant (at Belmond Napasai) are dining venues that come with our recommendations. There aren’t too many restaurants located within the vicinity, but you’re just 20 to 30 minutes’ drive away from the vibrant dining scene of Bophut and Lipa Noi. Spend quality time with friends and family at attractions like Maenam Viewpoint, Hin Lad Waterfall or the Samui Cultural Center. The months of May till October offer excellent conditions for kitesurfing; lessons and equipment rental are available at KBA Kiteboarding School (it’s about 15 minutes’ drive from your villa). Or plan an offshore day trip to Ang Thong Marine Park, a popular offshore destination known for its postcard-perfect scenery, kayaking, snorkeling and swimming. Speed boats depart from Nathon Pier, located 17 minutes’ drive from your villa.